Do you ever think there’s more to life than being really, really, ridiculously good looking? Yeah, neither do we. Hansel and Derek Zoolander are BACK, and fresher than an orange mocha frappuccino with their return to the runway at Paris Fashion Week. Shop their totally hot right now looks so you can dere-lick the competition like the hot little potato you are! Water is the essence of wetness, wetness is the essence of beauty, and geometric is the essence of Derek! Make like the male model of the year and ensure your outfit is ON POINT when you hit the city streets with your male model posse. Stick to bold, geometric prints and don’t be afraid to clash patterns. Now all you’ve got to do is wink, pose and BLUE STEEL! 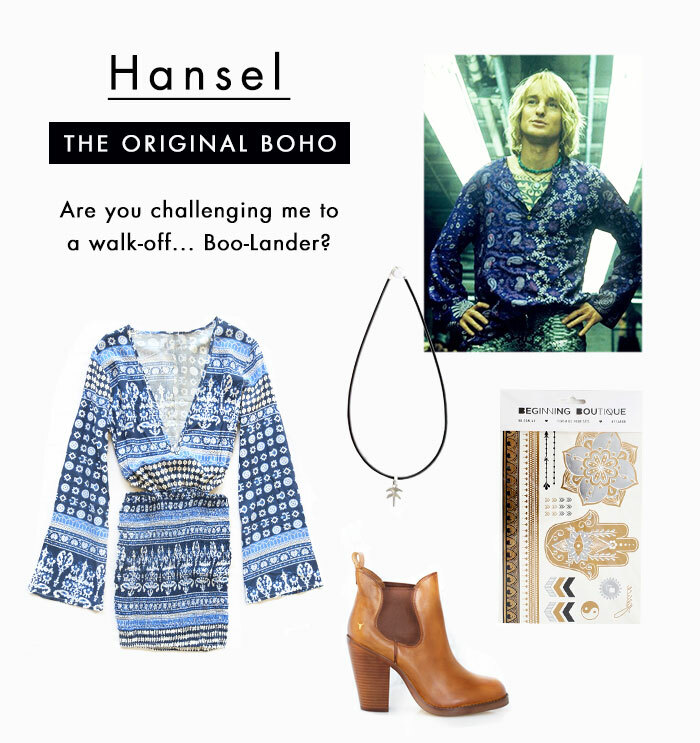 That Hansel – he’s so hot right now! Channel the style of original boho king with incredibly chiselled features, by mixing aztec prints with vintage boots, and layering with gypsy jewellery and metallic temporary tattoos. Now you’re ready to do some seriously stylish soul searching on the road, travelling or hopping the festival scene. Whatever, peace! If you’re thinking: “What is this? Clothes for ants?? These clothes need to be at least… three times bigger!” Don’t worry, all our clothes come in human size.